Stuffy, boring and tedious. This movie has some great parts and good scenes. But overall it just doesn't cut the mustard. 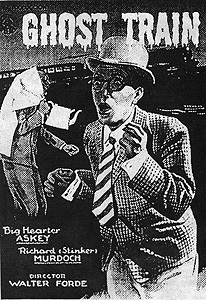 It's a British feature that acts as a vehicle for Arthur Askey more than an actual picture or movie. It tries to incorporate a good deal of drama as well but is overwhelmed with it's strangely dated quick witted humor. It's not a horrible picture, it's just terribly boring. Queue the old dark house narrative when we have a group of strangers all stranded in an old dark train station overnight. The group is haunted by trains and ghosts the entire picture. Also, someone is trying to knock them off one by one. The entire time they are being bombarded with sharply dim-witted comments spewed off by Askey the comedian. This movie was obviously filmed during World War II most notably during the German blitz on London. That accounts for the cramped nature of the picture. It's unfortunate. Arthur Askey is not the type of comedian you would like to be cooped up with. He is a little too over the top. The movie isn't scary. If you were looking for something to give you shivers, then keep on looking. It was probably much needed in England after the bombings. The humor may have been annoying and juvenile, but it must have kept the moods light. That kind of thing is important during wartime. I wouldn't suggest this film to any casual horror fans. This is for more of a horror movie's horror movie. It's a bit long for not really having much of a point. It barely kept my interest and Arthur Askey is really annoying. The rest of the cast was pretty forgettable too.